This week’s assignment for the Tea Blog-along is tough, because I like ’em all (save red teas). Every tea has a time and a reason. So, as it happens around here rather regularly, grab a cuppa’ and a treat and away we go! Morning: It takes a pot of black tea to knock the cobwebs out some mornings. One of my favorites is Harney’s Irish Breakfast Tea. It likes a healthy shot of cream (or milk) and about a half-packet of Splenda in a very large mug. An alternative would be chai with a good dose of milk, but I’ve yet to find that perfect chai to share. Next up, for through the day sipping is a nice green tea. There are plenty of sites promoting the health benefits of green tea, but all I can tell you is I’m almost never sick, and if a cold finds me, it moves on quickly. I like a variety of green teas, but one of my favorites for all day sipping in an iced form is Republic of Tea’s Sip for the Cure Pink Grapefruit Tea. I drop four bags in the Mr. Coffee Iced Tea Pot and have a pitcher of tea ready in no time. No sugar, no nothing. When I want a treat in a mug, I reach for Harney’s Chocolate Mint, which has a black tea base. Again, add the dairy, please? As the sun sets, I often switch to a white tea or an herbal for the last pot of the night. My white tea favorite is Adagio’s Silver Needle. Devon gave me some White Pomegranate from Trader Joe’s that makes me long for said store here. Herbals are special-use teas for me. Upset tummy? Celestial Seasoning’s Tummy Mint. Can’t sleep? Yogi Tea’s Bedtime. Both of those can be found in most grocery stores or health food stores. So, here’s a shot of Sissy’s damage to the one Bryspun. 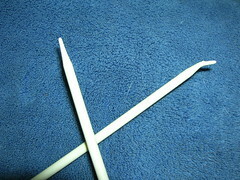 The one on the top/left is unharmed, and I used it for the knit/lace row, while using a wooden #6 for the purl rows. That got me through the weekend, and yesterday, I was able to pick up some bamboo needles. They’re working fine. It was also a good mail day. The bags I ordered from Stuck in Illinois arrived. 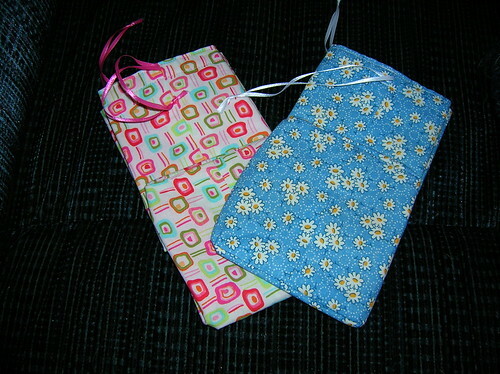 The pink one is for MJ, and she liked them enough to have me order one for her best friend too. They plan to use them for non-knitting items. Then, fortuitously, my spinning bag arrived from GypsyKnits. 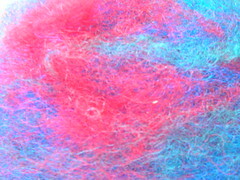 Kathy sweetly included some lovely roving for me to sample, but given my spinning difficulties last night, I put it back in the bag for a better day. The other thing I realized is that when I spin at a wheel, I pinch with my left hand, have the fiber on my right leg, and draft with my right hand. 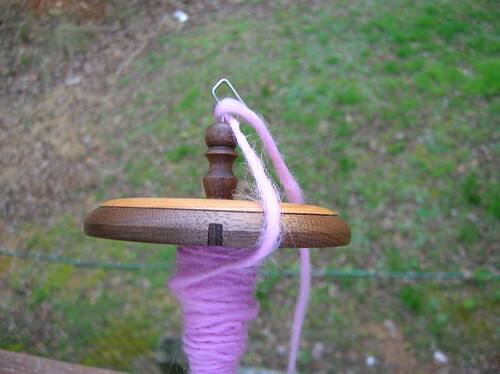 When I’ve ATTEMPTED to spin with a spindle, I do the exact opposite. 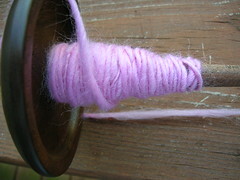 I roll the spindle UP my right thigh, wrap the fiber around my left arm, draft with my left hand, and pinch with my right. 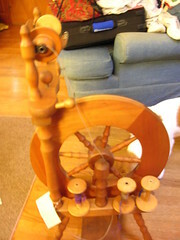 I need to switch that around, don’t I, since what I do at the wheel is so comfortable and the spindle feels awkward?? In other news, the Prince and Princess are at work today, and will be all week. Shadow was very happy to see them, and all three are resting quietly right now. 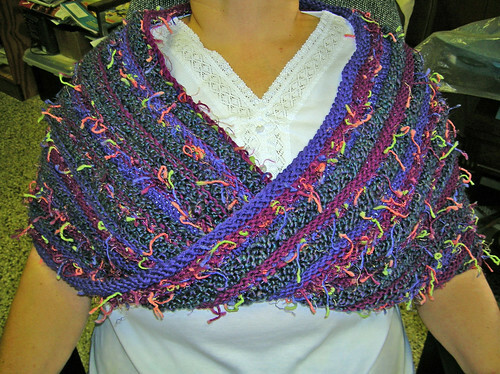 I keep forgetting to mention that Knitpicks has a Wrapped In Comfort KAL. Of course, Fredfoot and I have joined… I hope that I’ll return to him soon enough, but the Butterfly Stole didn’t see much progress last night. And since many of you are asking, we’re fine. We were quite a bit west and a north of the tornados. My brother inlaw was only 12 miles from the worst of them, but they’re safe and sound, as is his girlfriend’s family, which is good, as they have a funeral today for her maternal grandmother. Grab a cuppa’ and a snack, and hunker down. We’re going to play catch-up. See, it’s a rainy day at work, and that means I’m just sitting here in case the phone should ring. Slow isn’t the word for it. Pop is napping, and so is Shadow. Firstly, I have to boast. My dear friend Aviva has finished her Jupiter Shines piece, for which my hands were the model. Please follow any of the links to her post, because her art is PACKED FULL of detail, and you don’t want to miss a thing! It’s a part of a fabulous series she’s doing, so I encourage you to poke around her site. Next, it’s time to share the Secret Project. It’s really called Mary‘s Omega. Pattern: Omega Wrap by Chris Bylsma Designs This is my second Omega, and I think the pattern loves contrast. I really enjoyed matching up the yarns for this one. I did leave off the special bind-off and the little flappymadoo at the seam, because I find it uncomfortable when driving. (It presses into my back.) I just mattress stitched the two ends together, and MJ agreed that it was a better finish. Needles: My trusty #10.5 Harmony Options. 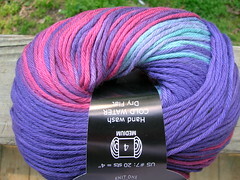 Yarns: The purple and the berry are both Cotton Fleece. The boucle is Lion Brand Homespun, and the novelty yarn, which coordinated perfectly with both Cotton Fleece colors is Squiggle, by Crystal Palace. I very randomly changed yarns as I knitted along. The yarn did all the work; I can’t say enough about this pattern! 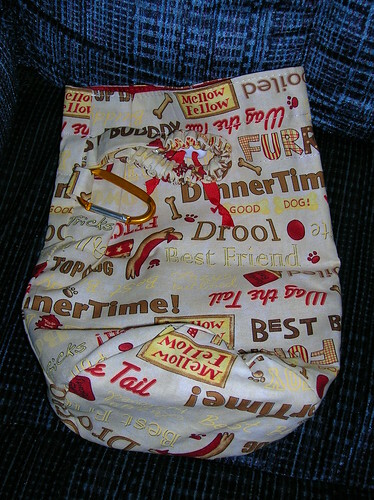 I hope it fits Mary and she loves it. I selected the yarns with her Vegas climate in mind, and I hope it arrived early enough for her to wear it a few times before summer grips them hard. I also have a book review for you. I mentioned Laura Moriarty’s The Rest of Her Life earlier, but I finished it Friday afternoon. It’s a great book that reads quickly, for me anyway. I soon got emersed in the lives of Leigh and Kara, and I needed to know how it all turned out. SPOILER ALERT!!!!!!!! Don’t read the next paragraph if you want to be surprised by the book. This isn’t The Glass Castle. Ms. Moriarty’s work is fiction, and it has a rather peaceful ending. (Not happy, but I close the back cover with a feeling that Kara and Leigh were both going to be okay.) Kara – the daughter who accidentally hits and kills a girl in a crosswalk while driving through town – is very much aware of what she’s done, and takes a more responsible path than her father would have liked her to take. She and Leigh – her mother – begin the novel with that rather stereotypical (and yet real! ), strained mother-teen daughter relationship, and that impacts much of the book. In the end though, there’s a real climax, where Leigh’s maternal instincts REALLY kick in, and the reader knows instantly that the very public display will make all the difference to Kara. It does. Leigh is not the soccer mom whom every kid wishes was her mom. She’s not even a particularly empathetic friend, but through the course of the book, we learn why she is the way she is. I’m sure some of my wonderful mom friends would be aghast from the first chapter at Leigh’s rather clinical approach to the crisis her family finds itself facing after the fatal accident. However, I think I would have related to Leigh without Ms. Moriarty’s in-person plea that we try to understand where Leigh was coming from before we judged her too harshly. Kara is a remarkable young woman, the kind of daughter ANYONE would be proud to claim. Even in her response to the accident, she remains a model teen. I’d like to think there are young adults like Kara out there. She’s truly a good kid, and she handles a horrible situation with tremendous sensitivity. I liked this book so well that in my rainy day tedium, I’m going to go order Ms. Moriarty’s first book, The Center of Everything. She’s the first of our Literary Feast authors about whom I can say I want to read more. I liked two of the other three books well enough, but not enough to seek out more from the author. I’m eagerly awaiting the announcement of next year’s author-speaker. If you read it, or have read it, let me know your impression of the book. I’ve found that while I cannot knit while I sit on the front porch playing with Sissy, I can read, so look for more book reviews in the future. This book gets a “couldn’t put it down to knit” rating, which is eclipsed only by a “couldn’t sleep until I finished it”. Well, I’m a week behind, but here’s last week’s -along’s topic. Hopefully, I’ll get to THIS week’s soon! While I love a good scone with my tea, my favorite treat to make is cheese straws. I have a host of recipes, from my stepmom’s cheese biscuits with a pecan half in the center (thing more of a cheese wafer), to hot, spicy straws that require a good wash of ANY liquid behind them, but here is my favorite recipe. Combine the cheese, butter, Tabasco sauce, 1/2 teaspoon salt and cayenne pepper in a bowl and mix well. Add the flour, stirring until a soft and easily handled dough forms. Spoon the dough into a cookie press fitted with disc #1 or a small star disc. Press into long strips on an ungreased baking sheet. Bake at 350 degrees for 20 minutes. Cut the warm strips into 2-inch pieces. Cool on the baking sheet. Sprinkle lightly with paprika and salt. Store in an airtight container. If a cookie press is not available, roll the dough on a lightly floured surface and cut into strips. From Start Your Ovens, Junior League of Bristol. I also collect JL cookbooks, and this is a favorite. Their Starting Line chapter is full of great recipes for teas, brunches, etc., but the Cheese Straws are from Happy Hour. Tea time certainly is a happy time too, right? In my mind, “R&R” means “recruitment and retention” a key element in volunteer organizations. However, I am aware that for many, it means “rest and relaxation.” Right now, I’m counting to ten, doing some yoga “centering” exercises, and trying to release my anger and frustration somewhere other than at Sissy. There are no photos, but I’ll be switching my Butterfly Lace to another set of needles. My #6 Bryspun straights are dead. Well, one anyway. I thought she was in the study with Mugsy and me. 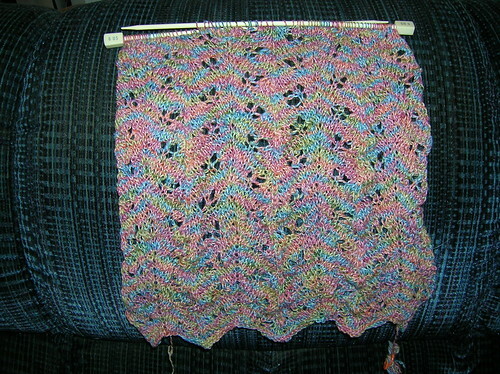 The good news is, the lace – about 25% done – is only slobbery wet, and still on its mangled needle. Only the tips and the inch or so at that end of the needles (laugh with me!) are ruined. I’ll have to wait for the Knight to get home, and have him cut the tip off while I protect the stitches on said needle, but I’ll be able to pick up where I left off. Now, I can’t even remember what else I was going to blog about. Oh yeah. My lace in progress. Ha. 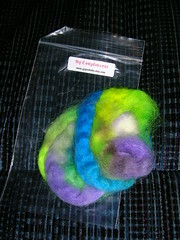 Anita also included this lush, angora blend. I wonder if I’ll ever spin well enough to feel I can do it justice? 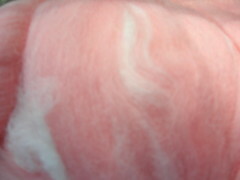 Almost looks like cotton candy, doesn’t it? Feels MUCH better though. Sorry to the Knight and the cotton candy fans out there. I don’t care for the stuff, but this? Ahhh… I have no desire to taste it, but I could be content to just hold it and pet it. This morning was also River City Knitters meeting time. What a great group! I wish such a guild for each of you. 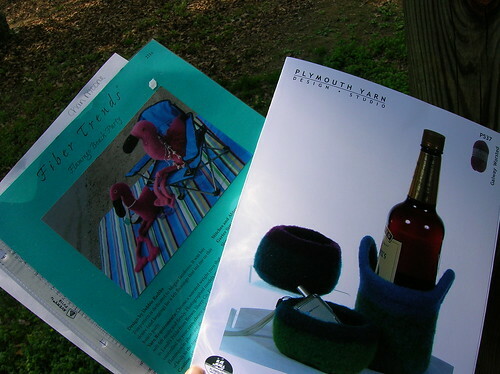 There’s an informative training session at every meeting, and this month, it was machine knitting. It was neat, but for the same money, I could buy a wheel… I also don’t knit for “production” purposes (although the deadlines I create for myself sometimes make me feel differently), so I don’t care about grinding out some stockinette in a heartbeat. I like the feel of the fibers slipping through my fingers, as one of the other ladies mentioned. Still, I’m a curious bird, so it was good to actually see a machine in use. A few ladies gave it a try, but I returned to my seat to chat (imagine!) and work on my butterfly lace (so Sissy could have an after dinner snack, evidently). Darlene (blogless) brought me these little wonders. 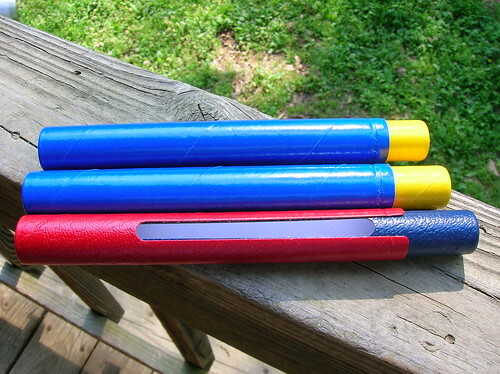 DPN tubes. The blue and red one with the slot is a wonderful little creature that will allow me to take my DPN sock on the road, because you know that after Magic Loop, two at a time becomes routine, I will still want to do a sock (or two?) on DPNs again. I’m fickle like that, but in the meantime, my pretty Harmony DPNS can live in sunny little homes, designed just for them. Thanks, Darlene! Today also marked the start of the RCK lace KAL. It’s my first ever mystery KAL, so I’m excited! Of course, I have no fewer than three yarns I’m considering for it, so stay tuned. Once I get the Butterflies out, I’ll cast on. 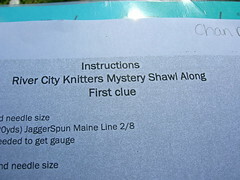 We get one clue every month, and even get to name the shawl. Fun, no? After the meeting, Rosanne and I went to Lettuce Knit. I was shopping for a couple of specific things, but I ended up just grabbing a couple of patterns and the TyDy colorway I’d wanted to try for the Clapotis. I might go back for more for a baby blanket if I don’t mind knitting with it. I think that’s going to become a regular stop for us when we’re in Richmond. They carry yarns I don’t see everywhere else, and I like that! Thanks so much for helping me put some time and distance between the slaughtered needles, Sissy and me. All that matters is that Sissy didn’t eat the yarn and require a trip to the vet, right? Add in that the lace is safe and sound, and I’ve really been crying over spilt milk, eh? Before I begin whining sharing my attempts at hand spinning, here’s a link to my fabu artist friend’s blog, where you can see the beginnings of her project for which she wanted the photos of my hands knitting. Do poke around while you’re there; I happen to think she’s very gifted and has such a fresh approach to art, combining it with literature, life, philosophy and so much more. So, I kept in mind my promise to Mary to spin for an hour, three days in a row, and set out for day #1 yesterday. 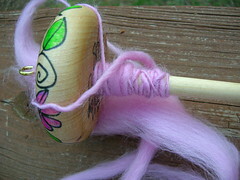 I started with FIRST, as I call my (duh) first hand spindle. 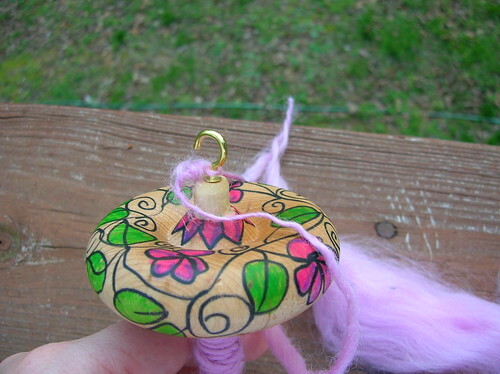 Anita the spinning prodigy had already told me she couldn’t keep it spinning, so when I got frustrated, I carefully pulled out my Kundert Spindle, tied on its leader, took a deep breath, and suddenly, found myself SPINNING. Note the thick-thin of FIRST’s yarn. It’s still far better than what I tried to produce in our brief interaction with hand spindles in the spinning class last month, but it’s hardly worth celebrating. In contrast, look at what a difference the Kundert made. Both of these bits were spun with the same roving, within a minute or two of each other. Yes, it’s hardly consistent, but it’s closer to it than FIRST’s yarn. Best of all, while it took me about fifteen minutes or more to spin that small bit on FIRST, I spun that on the Kundert in a fraction of the time… maybe two minutes? There you have my beauty, in need of a stately name. I moved the fiber out of the notch so you could see it and the hook. (If I had my favorite book with me, I could tell you what kind of hook it is, and why it’s the best kind for top whorl spindles.) I still have to pre-draft in a serious way, but I suspect that now that I am getting the hang of spinning with a spindle that actually SPINS, the rest of the techniques will come too. The Kundert and I enjoyed this view while we hung out on the deck. (FIRST might have too, but obviously, we haven’t bonded.) 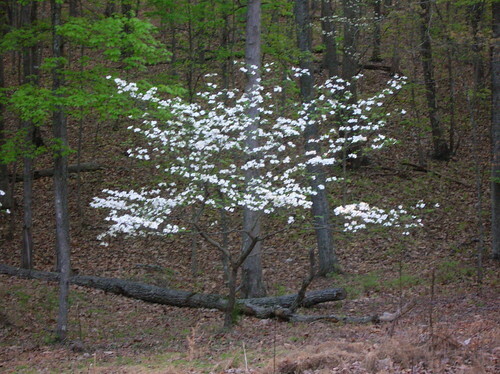 That’s a trio of wild dogwoods, the State tree and flower. 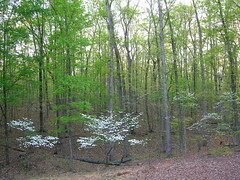 The local Dogwood Festival is in full swing, with the parade and the grand ball tomorrow. I still want a pink dogwood and a redbud, but not this weekend. Tomorrow, I’ll head towards Richmond for our knitting guild’s monthly meeting. Sunday, I hope to drive over to Pop’s hometown for the Cestari Wool Festival, as a warm-up for the Maryland Sheep and Wool Festival next weekend! 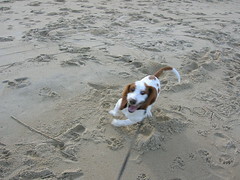 Welcome to this week’s Dogs on Thursday post, which is also the last post about our beach trip. 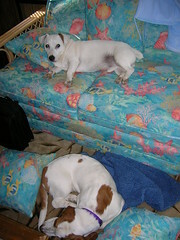 As you can see, Mugsy had a bit more freedom than Missy Sissy. She’s doing pretty well off-lead at home, but we weren’t about to risk it at the beach! Today’s also a very special day. Haddon Wood’s Princess of Joy, aka: Sissy, is six months old today. It’s hard to believe! Her other nicknames? “Me Do It” because she doesn’t want help with anything; she wants to do it herself. “Wild Child” – see the photo… There are others, but those are the polite ones. The Prince had a BIG time on the beach. 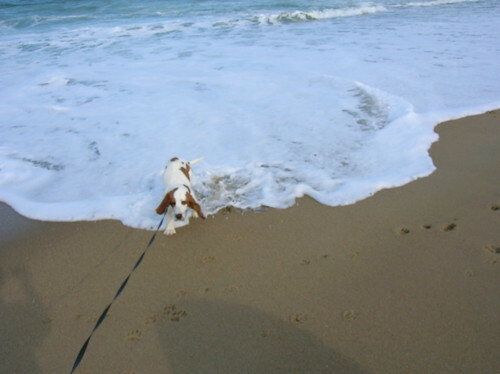 He loves the ocean, and had fun playing fetch in the surf. 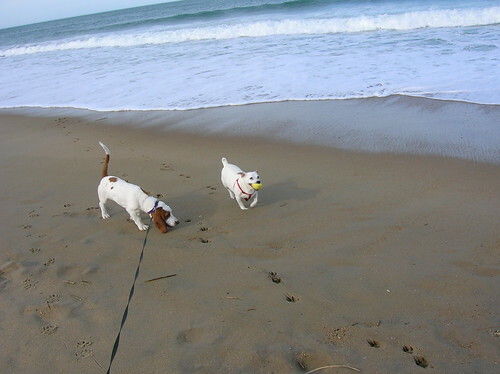 Because I had Sissy’s leash and the camera, the poor gal didn’t always get enough warning to avoid the cold, bad water. Is that not the saddest retreat from the ocean ever? 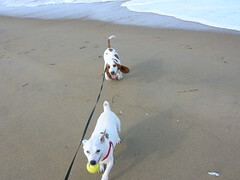 Despite being on the leash, Sissy still managed to run along and being a pesky little tag-along sister. 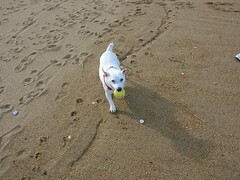 She loves the beach; it’s just that cold, wet stuff she doesn’t like. And she doesn’t otherwise mind water, as rain, bath, shower, etc., so we’re thinking it was the rather chilly temperature of the ocean that bothered her.